March 16, 2016 Arts » Arts Etc. Fairy tales and storytelling are as old as humans, probably dating back much longer than previously thought — some are possibly thousands of years old. For instance, Jamshid Tehrani, of Durham University, and Sara Graca de Silva, of the New University of Lisbon, theorize that Jack and the Beanstalk might be 5,000 years old, The Science Times reports. Regardless how ancient some stories may be, a handful of fairy tales and modern fiction — to the delight of children and adults everywhere — are coming to life at the San Antonio Botanical Garden via an ongoing partnership with the Alamo City chapter of the American Institute of Architects through an interactive exhibit called "Storybook Houses." Judges selected five submissions from design teams and artists that that were scored "on a variety of criteria such as creativity of design and use/re-use of water-resistant materials; focus on recycling, reuse or sustainability; accessibility; collaboration with others; and design appeal for all ages of visitors." 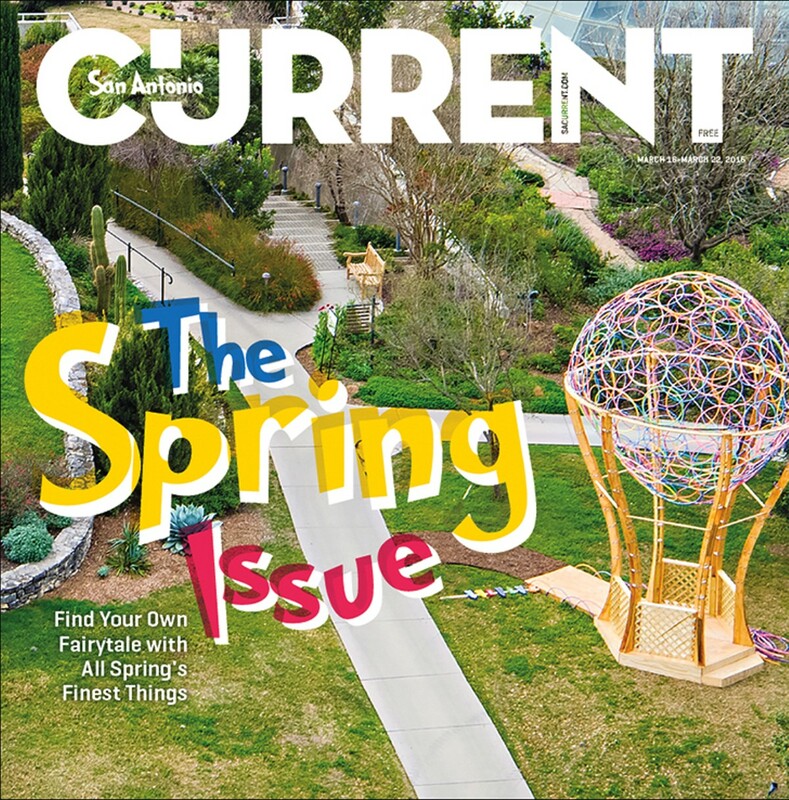 Cynthia Klemmer, director of programs at the San Antonio Botanical Garden, said she made sure that the books on the list for contestants to choose from reflected nature in some way. "Architecture is a place of science but also of art. So this is a wonderful embodiment of art and science coming together, and then literacy being woven throughout everything," Klemmer explained. From March 5 to July 10, Oh, The Places You'll Go!, by Dr. Seuss; Jack and the Beanstalk, often attributed to 18th century publisher Benjamin Tabart; Diary of a Worm, by Doreen Cronin; The Little House, by Virginia Lee Burton; and Sleeping Beauty, which has been told by multiple authors, dating back as far as the 14th century, will come to life. "The book will be right there [in the storybook houses] and you can read ... and I think it just helps kids connect because everybody knows Jack and the Beanstalk. [But] you may not have read it outside with the wind blowing through your hair, under the clouds next to a giant 20-foot beanstalk," Klemmer remarked. "It gives it new context, I think, and it's really exciting, and it really brings nature and the environment into the book." And rest assured, the books are available in the bookshop so the kiddos can revisit that trip to the San Antonio Botanical Garden each time they pick it up. 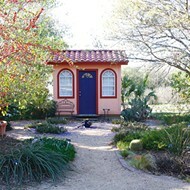 Written by Doreen Cronin • Storybook house design by Christopher Drown and Lauran Drown, of Bucrane Design Build, and Alicia Mendez, of Estella Mendez Art Company. This story is one for the little ones. Diary of a Worm is exactly as it sounds, it's an illustrated story of a day in the of one worm living in a gigantic worm world. And the hands-on storybook house promises to be a kid favorite that's as educational as it is fun. "Everything they do has to do with digging. The daddy worm actually works in a mine," Lauran Drown said. "I started out looking for a book related to compost because one of the things I started to explore and work with is digging and [I wanted] to point out how important worms are to our ecosystem." This storybook house is built like the entrance to a mine shaft, complete with a mine cart, walls textured to look like precious minerals and the perspective of going down the mine. But what's really cool about it is the mine cart. "The mine cart is full of worms that are making organic waste into compost," Drown said, scooping up some soil in her hands, holding a bunch of baby worms snacking on a piece of potato. 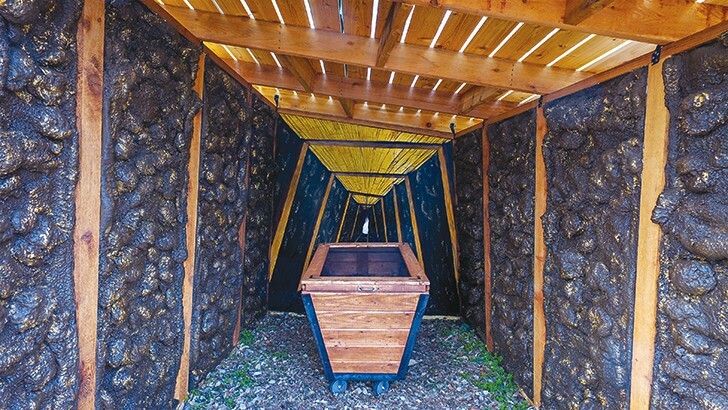 And like the composted food and plant material, the mine cart will be recycled by being donated to EcoCentro, a community outreach center for environmental sustainability, at San Antonio College. "We are providing a connection between worms digging and people digging underground," Drown explained. 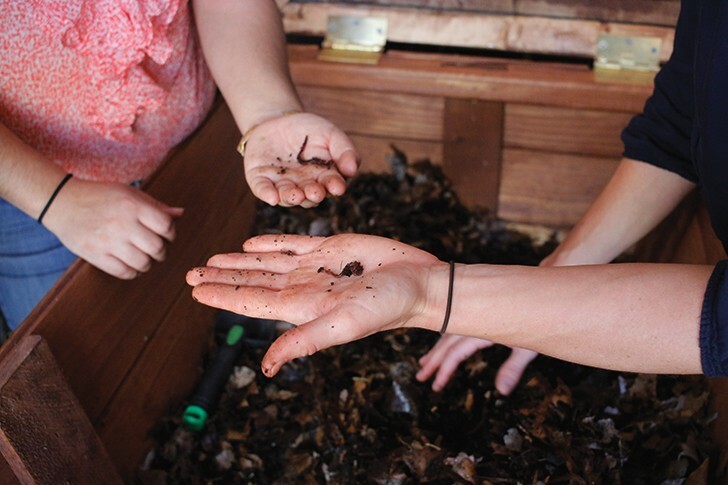 "People dig for valuable things and worms create something that's very valuable: compost." Written by Dr. Seuss • Storybook house designed by Belen Aguilar and Jeff Olivares, PBK Architects. Perhaps one of Dr. Seuss' most famous stories, Oh, The Places You'll Go! is often gifted to young people graduating high school or college and is about the challenges of life and the journey each one of us takes. And it was always one of Belen Aguilar's favorite books. "Also, it happened to be on my coffee mug at the office," Aguilar said. "So I hear about the competition and I look at my mug, and I said, 'I have to do this.'" She worked with Jeff Olivares on the design and figuring out how to start building the balloon-shaped storybook house. "It's kind of crazy once you start building this thing. We didn't really have an idea how tall it was going to be when we actually put it up," Olivares explained. "It was bigger than we thought it was going to be." 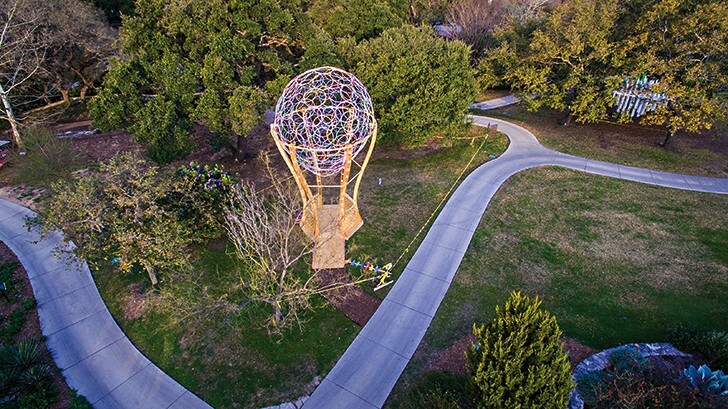 The two-piece structure's base is made of wood, but its top, which took a team of eight people using poles and hooks to place, is composed of around 250 hula hoops. "We have a lot of kids and people come up to it and just say 'wow' and stare at it. 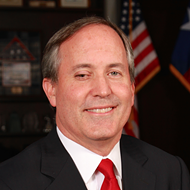 That's the best part of it," Olivares said. "It looks like it will be a kid favorite." Written by Virginia Lee Burton • Storybook house designed by James P. Beyer, RVK Architects, and Andi Galloway, Joeris General Contractors. This is a true Texas tale that many residents on the outskirts of San Antonio, Austin, San Marcos and Boerne can identify with. Virginia Lee Burton weaves a story about a woman who builds a house on a hill in the country. However, eventually a city grows up around the house on the hill. Then, years later, the woman's great-great granddaughter sees the house, and remembering stories of it, moves it back out into the country, on a hill, surrounded by nature, not steel, coming full circle. "It's the story of Bulverde, for sure," Galloway quipped. 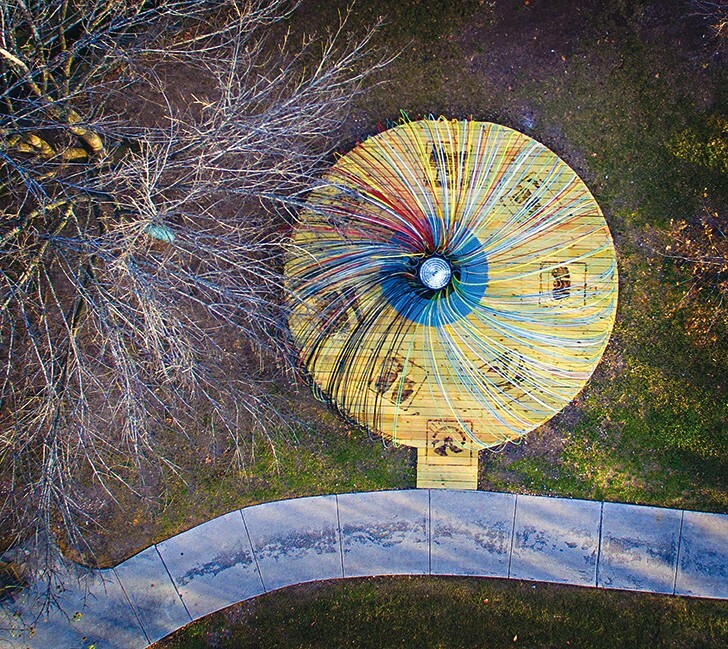 This storybook house is constructed of multicolored rebar in the shape of a circle. The rebar's hues reflect colors from the book, and as readers enter the storybook house, the rebar reflects natural color and has comfortable space between each strand. However, as you travel the circular route through the storybook house, the space between the rebar grows dense and the natural colors disappear into stark steel. Then, once you return to the beginning, the natural colors re-emerge, as does the space. "As you're walking around the structure, you're actually in the story as well," Beyer said. The storybook is ADA accessible, which was important to the design, Beyer explained, adding they burned illustrations from the book onto the wooden floor. 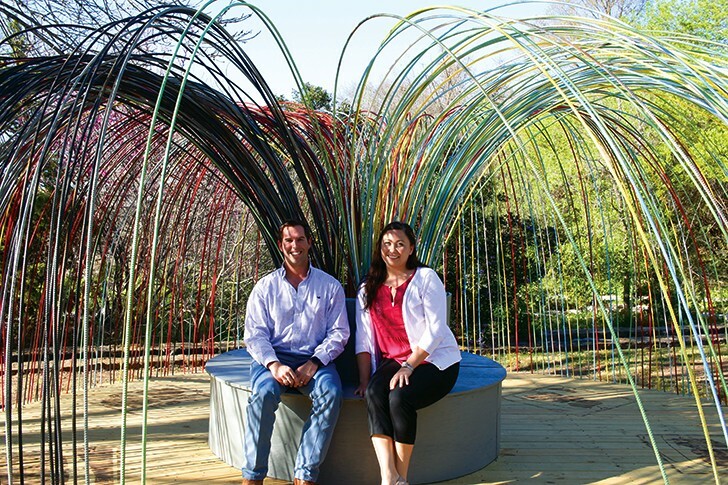 "What's really fitting about it is it's made of industrial materials, and it's set within a garden that's set within the city that's grown up around it," he said. The most popular version was published by Benjamin Tabart in 1807 • Storybook house called "San Antonio and the Beanstalk" is by Lucas Mackey, Esau Hernandez and Marcel Van der Maas, all of Overland Partners. We all know this one. Jack foolishly trades his impoverished mother's cow for magic beans. The mother, being righteously furious, throws the beans outside and sends Jack to bed. Come nighttime, a giant beanstalk that leads to a castle in the sky grows. You know the rest. 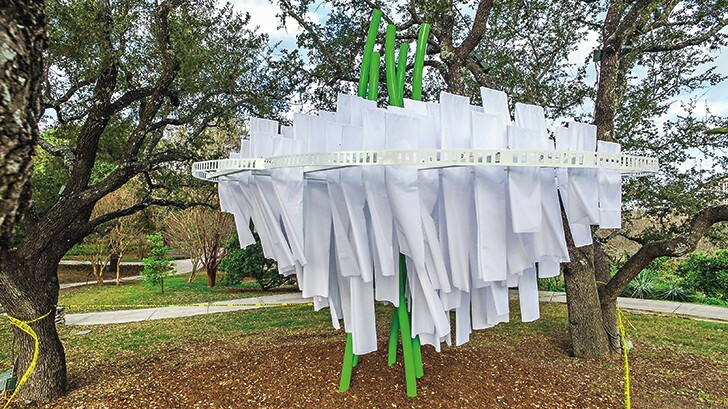 "This installation is to bring a cloud from Jack and the Beanstalk down to San Antonio," Mackey said, adding that they made sure the installation was interactive. "So you could come create your own stories and adventures." To do that, they created 90 different cloud panels that drape down in nine different sizes over the beanstalk. "We mixed those up to create this cloud shape," he said. 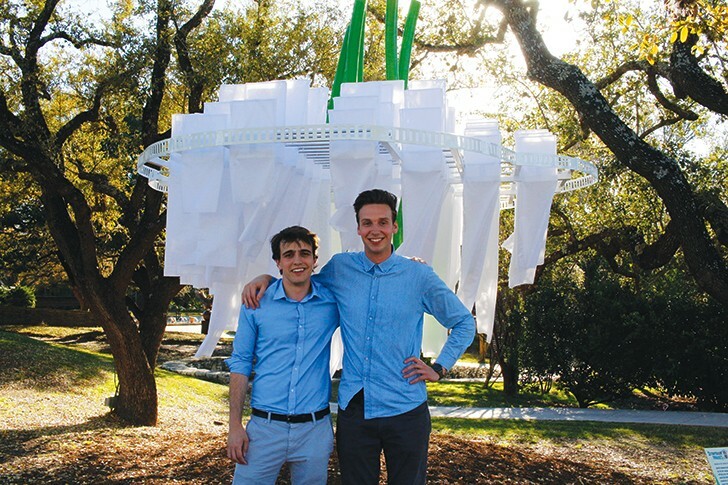 The cloud is made of scrim fabric, which was recycled from Overland Partners' installation at the most recent Luminaria. "We just wanted, and a lot ties into the garden's mission, like, we should be good stewards of the planet, and we're reusing what we can and trying not to waste," Mackey said. 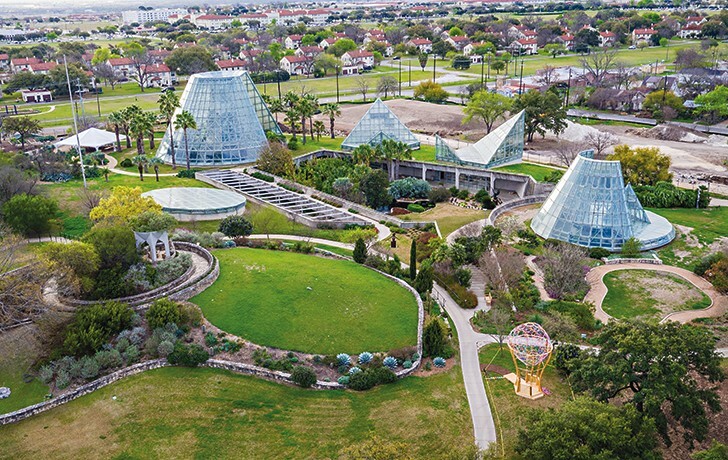 Luckily, for the Alamo City, this whimsical structure isn't going away once the "Storybook Houses" exhibit concludes at the San Antonio Botanical Garden in July. "The rest is made of steel. One of the reasons we chose steel is because we are planning to put this somewhere else in San Antonio once it's done," Van der Maas said. 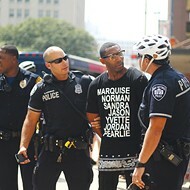 "Again, tied to sustainability and not dispose of it and give it back to the community. 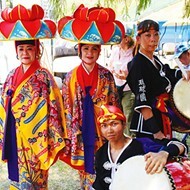 We are hoping this can be in a public place for people to enjoy." Originated between 1330 and 1344 in the anonymous prose Percefores • Storybook house by South San Antonio High School student Ernest Guerrero. 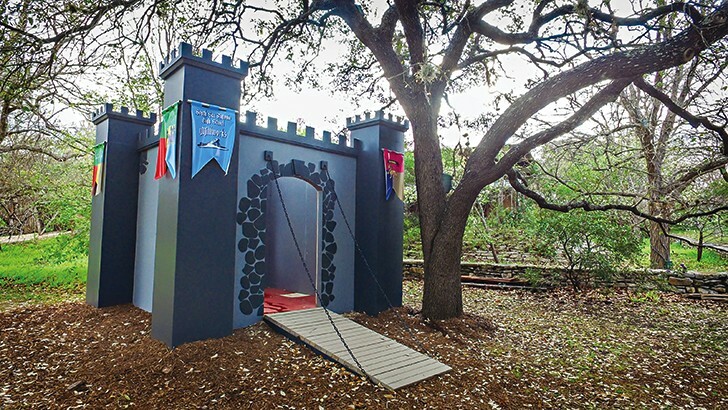 There's a castle in the San Antonio Botanical Garden complete with a bed for a sleeping beauty — or just for a catnap near WaterSaver Lane. 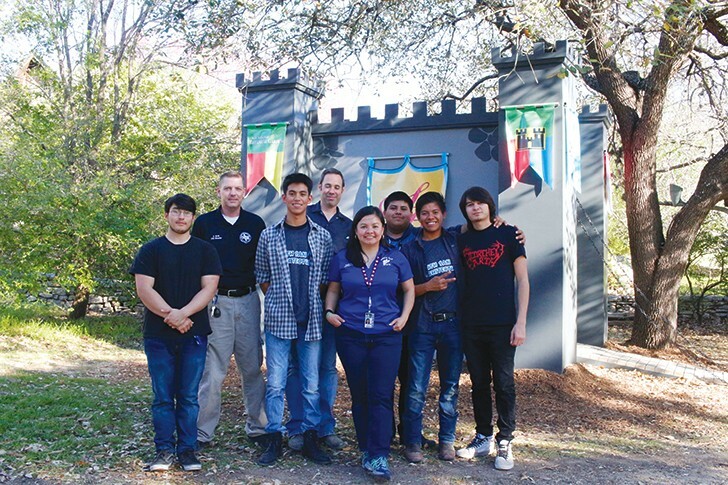 Ernest Guerrero is the only student to design a structure for the "Storybook Houses" exhibit. "I thought the bed would be a nice draw for kids," Guerrero said, flanked by his teacher Angelica Flores. 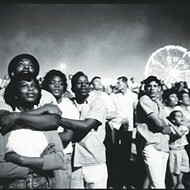 "They could take pictures out the window and re-enact the story." As for the castle, again, he's just thinking of the children. "I thought kids would find it interesting, the castle being out in the woods, in the Botanical Garden," Guerrero said. While he may have designed the structure, Flores said it was a group effort between the advanced architecture class, the construction class and art students who were interested in helping out with some of the painting. 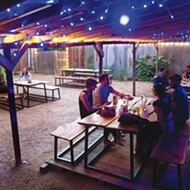 "After designing it, we became worker bees," Flores said. "When we went into the woodshop, we didn't know how to use the tools or how to go about it." And Guerrero and South San Antonio High School didn't get a free pass, either. Klemmer said the Botanical Garden didn't realize that the submission was from a high school until after the fact. "They chose five projects and I'm the only one who is a high school student who doesn't work for an architecture firm," Guerrero said. "That feels really great."